A tough, durable and easy to manoeuvre piece of garden equipment, The Handy 60lbs Drop Fertiliser Spreader, is the ideal solution to spreading seed and fertiliser quickly, efficiently and accurately with minimal effort. The generous 56cm spreading width speeds the process up and drops evenly whilst the hand controlled cable means you can open and close the spreader gate at the touch of a finger – no back-breaking bending down every time you want to open up the gate. 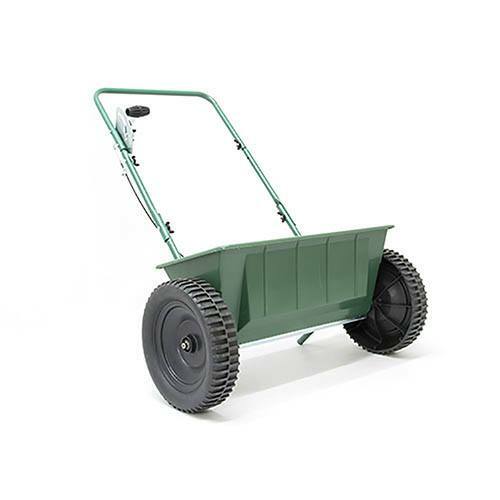 The large plastic wheels make manoeuvring a breeze even over more rugged landscape and larger areas of lawn. Lightweight and easy to use, The Handy Drop Fertiliser Spreader is the perfect tool for the job.